Located in the Tulpehocken Creek Valley of Berks County, the magic happens when you crest the last hill of the country road leading to the Village. 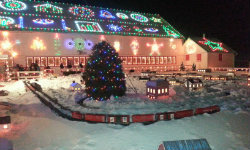 More than a half million Christmas lights beckon you…you are nearing Koziar’s Christmas Village. What began as a gift of love from Mr. Koziar to his wife and children, has evolved into one of Pennsylvania’s top ten attractions. In 1948, William M. Koziar started decorating his house and part of his property. As the years passed, not only were more decorations added to the house and barn, but included the lake, walkways and the like. As people appreciated and complimented William on the displays, the decision was made to allow visitors a closer look…the “Village” was born. Today you can peek inside numerous glass houses for a glimpse of Toy Maker and his Toy Shop, Christmas Beneath the Sea, The Olde Church, Old Fashioned Bakery Shop, to mention just a few displays offered. Shop for gifts, souvenirs and delicious bakery items. Interesting to note: Recipient of the Award of Excellence from the Pennsylvania Travel Council. It is advised to dress appropriately for the weather as there are both indoor and outdoor displays. Visit and have your picture taken with Santa. So you won’t be disappointed, check their website for days and hours, as well as directions. Bus Groups and Entry Bargains! There are special discount rates available for bus groups. Be sure to get all the details from their website. Children 3 and under are admitted FREE. Seniors are offered a discount rate of $8.00. In this world of ever-rising costs, this is a true bargain for hours worth of fun for the entire family.